Wishing For A Winter Wonderland? A leisurely walk along the gorgeous beach where the goddess Aphrodite rose from a gentle wave, followed by a visit to a Crusader fortress and tour of a boutique winery: it may sound like a day in paradise, but it’s just another winter’s day in Cyprus. This is the season when daytime temperatures are seasonably fresh, days of sunshine are rarely marred by rain and hotel and tour prices dip to irresistibly attractive levels. The months of November through March in storied Cyprus, the island republic in the eastern Mediterranean that joined the European Union this year as a full member, are a unique passport to discovery for travelers who take advantage of shorter days and thinner crowds to see the places once coveted by ancient Greeks, Roman generals, and illustrious invaders like Alexander the Great. Although Cyprus is the third largest island in the Mediterranean and geographically diverse, it is remarkably compact and, thanks to a modern infrastructure which includes an excellent and well-maintained road network (with signs in English and Greek), very easy to explore. Within an hour’s drive from the capital city of Nicosia (Lefkosia in Greek), famous for its wholly intact Venetian walls and bastions in the shape of hearts, are the Troodos Mountains, home of Cyprus’s very own Mount Olympus which gets enough snow in the winter to make skiing possible. The pine-clad peaks are also home to miles of well-marked hiking trails and numerous wondrously painted Byzantine churches on UNESCO’s World Heritage List. An hour’s drive due south of the capital will bring you to landscapes more typically associated with the Mediterranean coast – hillsides studded with lemon and orange groves, authentic villages like Omodos and Laneia that hum to the rhythms of authentic tavernas and mosaics workshops, and plains with olive and cypress trees that slope gently toward a coast first settled by the ancestors of ancient Greeks and Cypriots some 10,000 years ago. On a broad cliff facing the south coast is Kourion (Curium), an archaeological showstopper that includes an ancient Greek amphitheater, extensive Roman mosaics and the evocative remains of an Early Christian basilica. Nearby the impressive site are the ruins of the Temple of Apollo Hylates, protector of the woodlands. 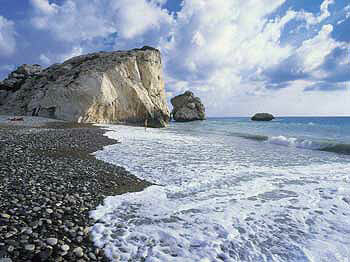 But when it comes to deities, Cyprus really belongs to Aphrodite, who rolled ashore eons ago on the foam of an azure-hued wave at Petra tou Romiou, a white pebble beach west of the port city and cruising center of Limassol, also known for its immense boulder formations. According to myth, the one and only goddess of love and beauty liked to frolic in the green countryside around Pafos, an enchanting seaside town in the far western part of Cyprus. With its awesome collection of in situ Roman mosaics, subterranean Tombs of the Kings and important Christian sites such as St. Paul’s pillar, the whole of Pafos is on the UNESCO’s World Heritage List.